I am an anthroposophical researcher from Pennsylvania and a faculty member of the Global Event College, directed by Yeshayahu (Jesaiah) Ben-Aharon. I am full of truth, devotion and grace. I remember when I was once born from the Father. His glory beheld me. We dwelt with Him. My flesh is becoming the Spirit-Word. I believe in His Name. The spirit wakens in Man. My flesh becomes the spirit's will. My blood becomes the soul's life. The I is born as the Son of Man in me. And the Son is born in the I of God in Thou. My power is in my belief in Him, for He received me. But He came to me once and I did not at first receive Him. Yet I sense Him now when the World rejects Him. His true light set fire to my I, and lit up the world. My light becomes true through Him. I bear witness to His light and believe. I am John, a free man, sent to Heaven, to bear witness of the Earth. The darkness of the earth begins to understand the light. The earthly obscurity begins to shine in the light. Man's new light shines into God's life. Nothing and Everything were made by Him. The Word of Man was in the beginning and will be in the future. In the future I will be with God's Word. And the Word of God will always be with me in Him. Him in me. Not I but ... in me. The etheric body becomes the liquid of clear quartz, flowing with inner light. In the center of the World and the Human Being. Jack Kirby, Levinas, Ben-Aharon, Steiner, Deleuze? 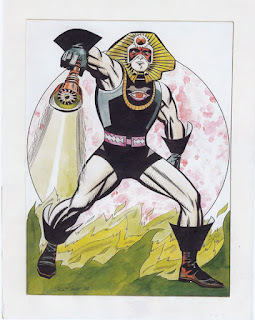 Jack Kirby, Deleuze, Yeshayahu Ben-Aharon, and Levinas? "Our hearts are shattered and filled with hate to protect their painful vulnerability. The deepest evil tendencies in me can rise up, but I can find ways to bridge and transform them with hope and creative love. Both the act of repose and the kinetic are rhythmic polarities in a pulsating metamorphic fluid that is sometimes inward or humanlike and sometimes outward or worldlike. Creative thinking must find ways to tie together temporary organelles of every quality into a new human actor. Like Jack Kirby’s Mister Miracle, we can become a super escape artist who doesn’t mind getting back into the coffin once again. 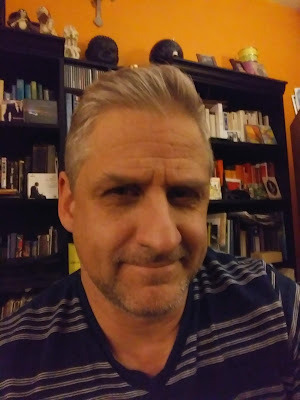 The supersensible-I can slip out of any trap, but it can also turn back to face the real bottom floor of moral evil in its own most human earthly nature. But who is this new kind of human that can begin movement and slow down to a rest, this wave of supersensible lightning? Where does rest take me? What kind of self stays awake in the yonder? And these should be ethical questions. Can we with the greatest humility and resilience, keep this mood alive today as we craft a new self and learn to move in spirit-space? This Event is still alive today and new Events are coming from the most innovative future. To remain conscious in the midst of these moral world-riddles, while the rotation of the universe churns in us, requires the most careful, objective, and scientific scrutiny. It is not accompanied by paranoia, delusions, hallucinations, or an overly ecstatic feeling. Indeed the extensive feeling of responsibility can be painful. But thank God that the pain reveals itself to be the intensity of the neutrality of the macrocosm piercing our warm, immoral bubble. 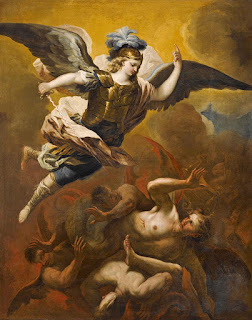 Levinas says, “In proximity the other obsesses me according to the absolute asymmetry of signification, of the one-for-the-other: I substitute myself for him, whereas no one can replace me, and the substitution of the one for the other does not signify the substitution of the other for the one. The relationship with the third party is an incessant correction of the asymmetry of proximity in which the face is looked at…it is only thanks to God that, as a subject incomparable with the other, I am approached as an other by the others, that is, ‘for myself.’"
Dactylotum bicolor, the Rainbow grasshopper, can be a wonderful inspiration for people who are interested in the new Cognitive Yoga or the Living intensification of Perception and Thinking. One could call this new science, breathing in colors and breathing out pure thinking, and then opening a doorway in the middle. 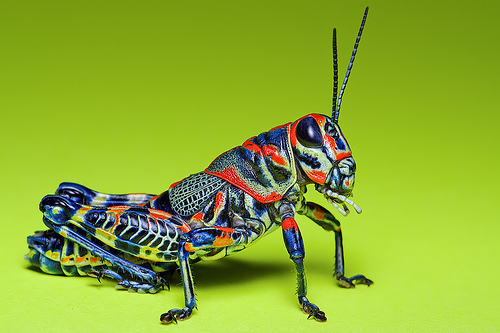 We ourselves can learn from this grasshopper, how our reverence to colors can be 'breathed into' our whole body, soul, and spirit (however, we do not alter the physical breathing at all). 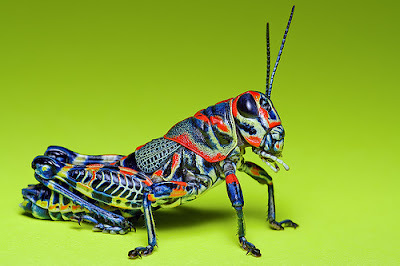 We bring all that was done unconsciously to this grasshopper into full creative consciousness. We can experience the two antennae in our heads like Ms. Grasshopper, but now creating a third wakeful organ in between. We see that Mr. Grasshopper has two hands at his throat, we ourselves can create a new living-speaking organ in a similar fashion to communicate with the new life that is streaming all around us, in 2018. 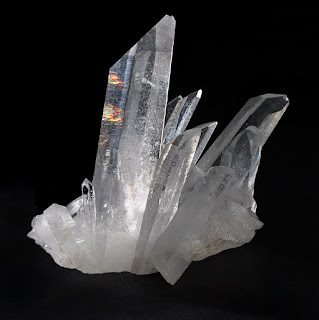 We don't have to lower our consciousness to become ancient grasshoppers, but instead we keep our I AM fully awake, and 'perceive' the moment by moment activity in our concepts, and the light behind concepts opening us from the outside. What do we experience when we KNOW and dive into the contours of the concept of any grasshopper whatsover in our wide awake thinking? Will we be able to create wings to fly down into life, like dear Mrs. Grasshopper? What will human wings, created little by little out of morality and virtue look like in the future? You will have to decide, since each one of you is your own species. 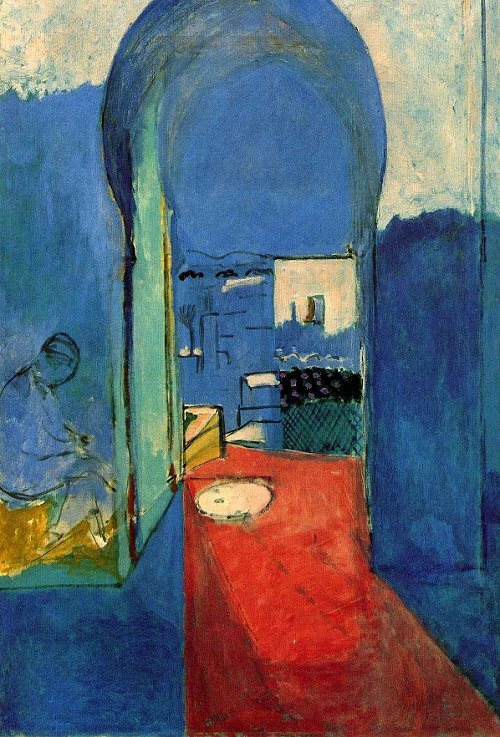 'Entrance to the Kasbah' by Henri Matisse (1912) provides a wonderful invitation to enter into the world of pure color. We find that the dimensions of regular space have collapsed as we gently dive into the painting. What could be recognized as a doorway in everyday consciousness, becomes turned inside out and topsy turvy, when we separate out our mental images, memories, personal ideas, and projections of desire and control from our moment by moment experience of pure color. We become the 3 dimensional doorway, as the red pours into us. We fill the space outside our past body. We engage ourselves, or gently propose to marry the multicolored woman of space. She was once invisible but now her pregnant full body is everywhere, in every nook and cranny. And behind her is another mother, multicolored, rainbow life. She weds me in ever moving, ever metamorphosing color and hue and shade. But my I is now awake, and I turn to the thinking pole, which opens up a new realm of archetypal invisible meaning life, behind and between every color. And what is in between the pulse of thinking and the pulse of color? Do I sense the flood of time? Do I hear the moral call of the unheard speech of color calling to me? 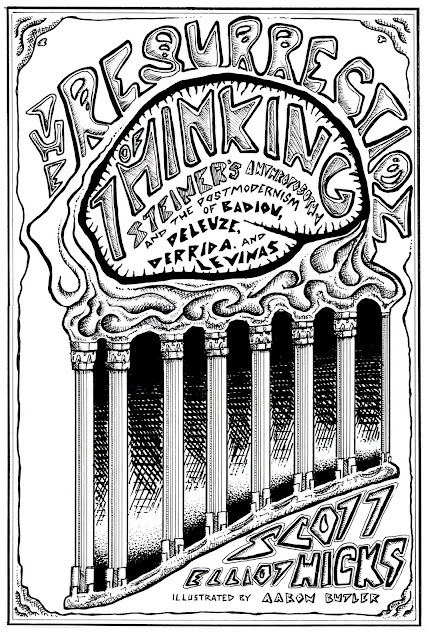 New Book, "The Resurrection of Thinking" Now Available!